This was a cake for firsts for me. First time making marshmallow fondant. I could go on. But the main point is, I was a bit of a nervous wreck brining it in. Presentation wise, to be honest, I didn’t like it. I’m not even sure why. But it wasn’t like the picture of perfection I had in my head. If you don’t live in either Australia, New Zealand, Singapore or Hong Kong, your country won’t be home to a Spotlight store, so you probably have no idea what it is. It started off as a fabric store at Vic Market, but has since grown into a fabric/craft/haberdashery/homemaker/party/etc retailer. So I wanted something bright and colourful. Hence the choice to do a neapolitan cake. 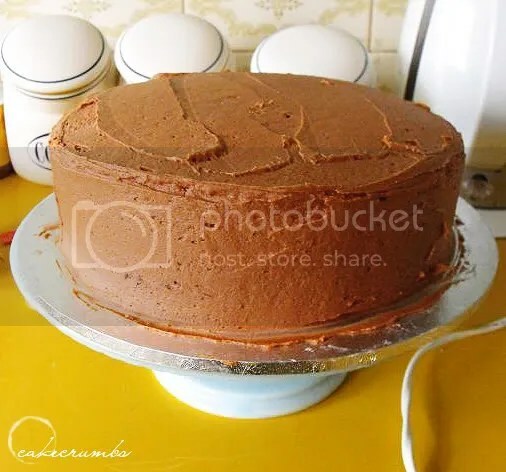 Next came the chocolate buttercream (usually, this recipe calls for a chocolate icing which is a tablespoon of icing sugar away from being a chocolate ganache, but under fondant I went for the buttercream). 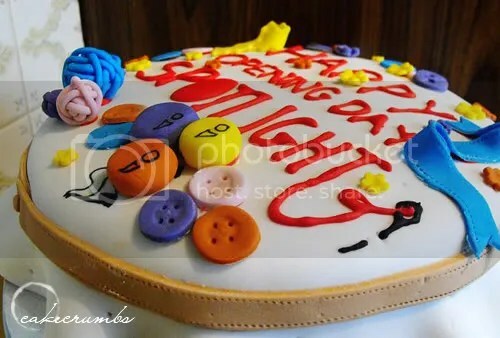 Then for the fondant decorations. 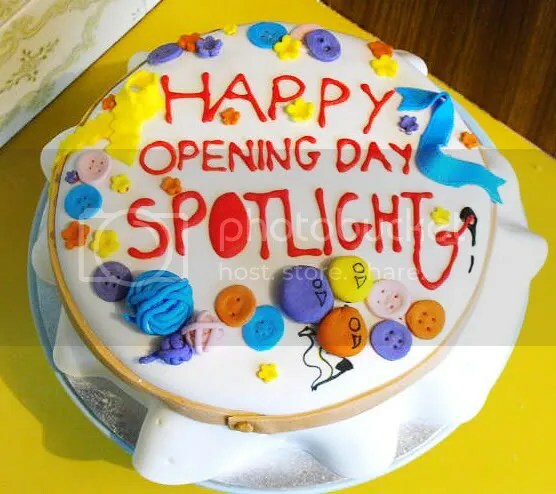 I had never make marshmallow fondant before, let alone used it, so I was nervous about using it for a cake I’d be showing off on Grand Opening day. Would it stiffen enough? Would it be pliable enough? How good would it be for moulding? Would it taste as good as everyone said it did? 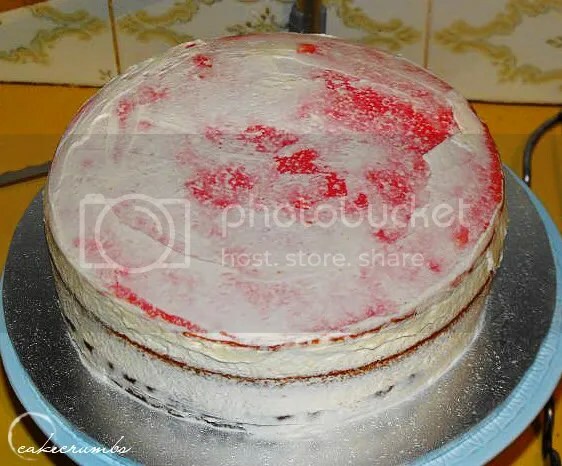 Turns out it was amazing to use for covering the cake. It didn’t crack and withstood rough treatment, and tasted so much better than the usual stuff (though not as yummy as marshmallows themselves). It provided a perfect finish and was a cinch to use. The idea was supposed to be that of embroidery cloth. The words were to looks “backstitched into the canvas. 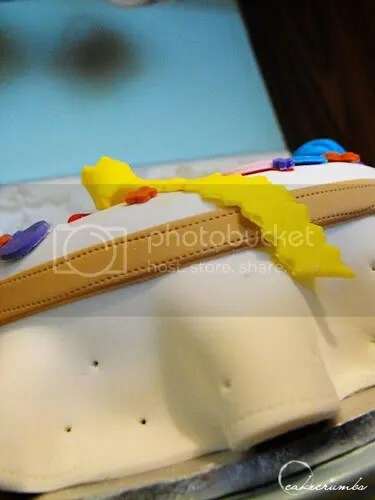 I only wanted the embroidery pattern to be on the top portion of the fondant, not down the sides of the cake. 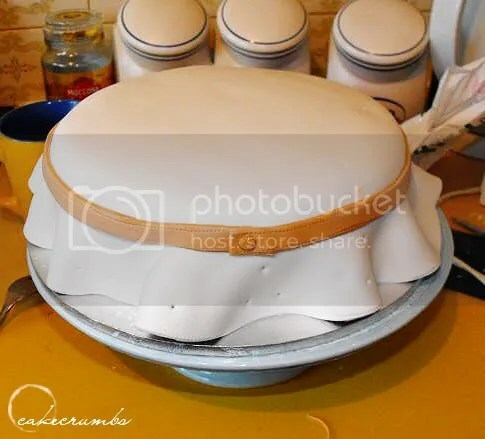 So I used the embosser once the fondant was actually on the cake. Mistake number 1. It failed. I smoothed out the top again and moved on. Next came the embroidery hoop. Then I started modelling things the store supplies. I got teased for being biased towards Craft/Spartys (my department), but it was more aesthetics than anything. 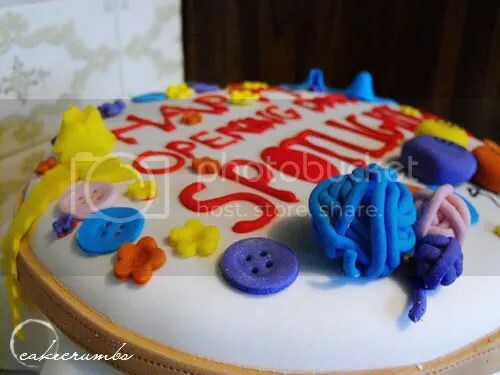 I mean, to do Manchester or Furnishings or Custom Made would have required me to basically make bits of fabric out of fondant and I a) didn’t have room to lay them after doing the piping, and b) …. meh. So I stuck with yarn, ribbons, balloons, buttons (there’s some habby) and blossoms. I ran out of motivation (and time… and space) after that. As far as modelling ability goes, not a huge fan of marshmallow fondant. It just didn’t work as well as the other stuff. Perhaps that was just my ratio of icing sugar, or perhaps that’s just a general rule with marshmallow fondant. No idea, but I will be using my regular fondant to do figures in future. And once it was finally done… it just irked me. I don’t know why, but the look wasn’t right. Perhaps it’s all the white, I’ve never covered a cake in plain white fondant before. I dunno. I was told to shut up and stop being picky; the cake was a hit. But I still just can’t like it for some reason I can’t put my finger on. 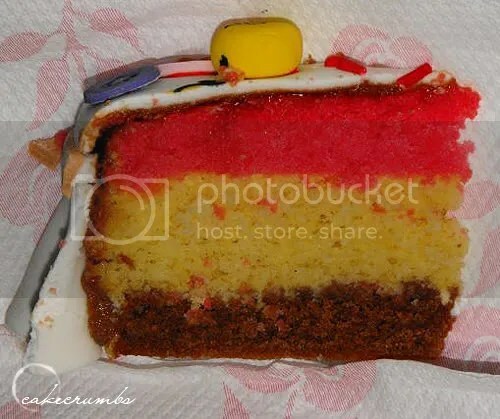 I would have liked a picture of the whole cake cut, rather than of this dilapidated-looking slice after the journey home, but I felt weird going “oh, could you stop eating it while I take a picture of my cake’s innards” in front of everyone, so that’ll suffice! Want to taste it for yourself? 1. 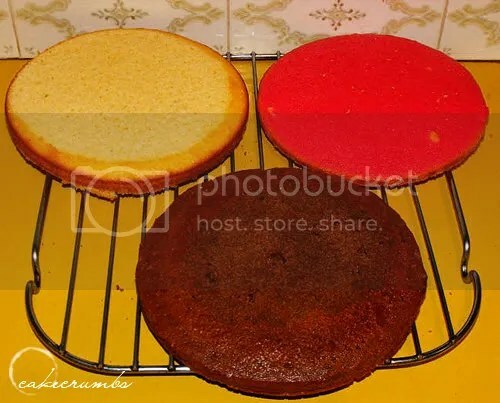 Grease three 22cm round cake pans. Line with baking paper. 2. Beat eggs until frothy. Gradually add caster sugar, half a cup at a time, beathing well after each addition. Beat for a further 5 minutes, or until thick and creamy. 3. Fold in sifted self-raising flour until just combined. 4. Place butter, milk and vanilla extract in a small saucepan. Stir over low heat until butter melts. Gently fold in two batches into egg mixture until combined. 5. Spoon one third of cake mixture into one of the pans for the vanilla layer. 6. Divide remaining batter into two bowls. 7. Add pink colouring and strawberry essence to one portion and stir to tint pink. Pour into second prepared pan. 8. Blend cocoa and extra warm milk to form a paste. Stir into remaining portion to make chocolate layer. Pour into remaining prepared pan. 9. 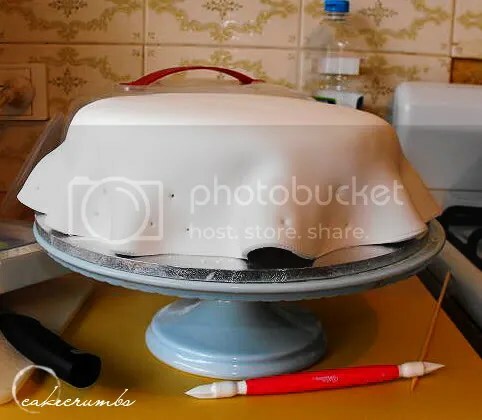 Cook cakes, on two shelves, in a moderate oven (180°C) for about 25 minutes, swapping pans half way during cooking (I preferred to cook the cakes individuals). 10. Stand cakes in pans for 10 minutes. Turn onto wire rack to cool. 11. Level your cakes, then assemble with whipped cream. What is carton thickened cream? Can I use sth else instead or make it myself? Thickened cream is what (I think) other countries call whipping cream. It has a fat content of ~35% and usually has gelatin or other artificial stabilisers in it to make it suitable for whipping. It’s the most commonly sold cream here – it’s not ideal for cooking or for ganache, but you can get away with using it. 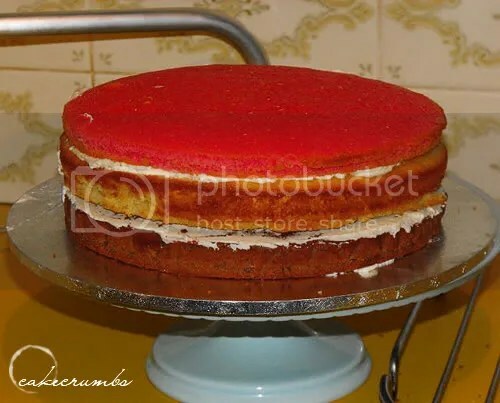 The cream is only for layering in between the cakes, but you could use anything you want.